YuppTV Blog: YuppTV launches its first original content with a web series starring Cricket Legend – Brian Lara is NOT OUT! YuppTV launches its first original content with a web series starring Cricket Legend – Brian Lara is NOT OUT! YuppTV an internet based TV streaming service provider, is set to launch its first original production with a web series, starring Cricket Legend Brian Lara, on 6th November, 2015. 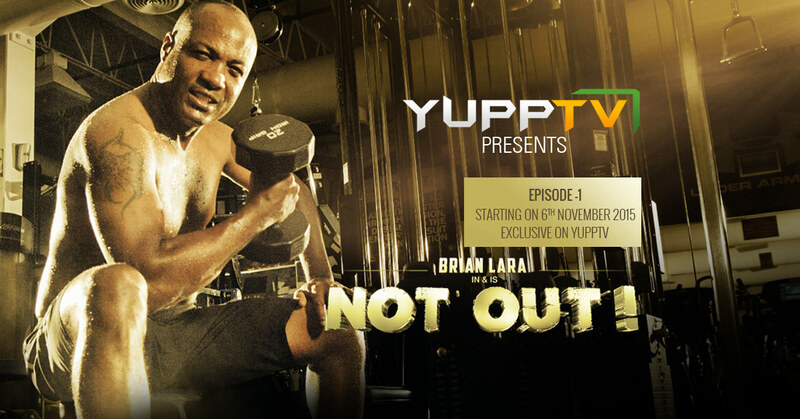 The web series is titled “Brian Lara is NOT OUT!” and will exclusively be shown in five episodes only on YuppTV. Mr. Uday Reddy - Founder and CEO of YuppTV is the debutante Producer of this series along with Mr. Madhura Sreedhar Reddy. The story of web series -“Brian Lara is NOT OUT!” is based on God of Cricket Sachin Tendulkar, inviting Brian Lara to play in three- match All Stars Cricket 2015 series to be held in November 2015. All Stars Cricket 2015 is a platform for all legendary players to play their favorite game again after retirement on American soil. The two Teams to play are Sachin’s Blasters and Warne’s Warriors. The exciting script revolves round Lara’s personal Life, his passion for Cricket, his tips on cricket for aspirants, more sneak peek into the real Brian Lara and on how he prepares himself physically, mentally and emotionally to play again at 46 in the All Star Matches. This web series can be watched from anywhere in the world on any internet connected devices like Smart TVs, android and iOS smartphones and tablets, gaming consoles, Blu-ray Players etc. via YuppTV app. The 5-episode Brian Lara web series is available on subscription basis. The process to subscribe is seamless through varied online payment options. YuppTV the World’s largest Over-The-Top (OTT) provider for Indian content has 200+ Channels in 13 languages, more than 5000 Movies and hundreds of TV Shows at the click of a button. Apart from the Live TV experience, YuppTV offers Catch-Up TV feature whereby viewers can watch TV content from past 7 days and never miss their favorite Shows. Mr Uday Reddy, Founder & CEO of YuppTV said, “Brian Lara web series is a major step for YuppTV towards providing access to high quality content to all its viewers over numerous internet connected devices using YuppTV app. We are excited to launch this original content with a passionate sportsman – Brian Lara. The first original content, the sports connect, the debutante Producer opportunity; adds more feathers to YuppTV”. Brian Lara quotes, “I am excited to play again, I am more excited to see that people love me even more than before. I am overwhelmed to see the huge response for Not Out’s curtain raiser. I thank YuppTV and Uday for this great endeavor”. Madhura Sreedhar Reddy says "Brian Lara was inspiration to all the cricket lovers across the world. But, it’s great to see him inspiring even at the age of 46 years. We are very happy to make this Video series with Brian to inspire all the passionate sports lovers!" For more information visit http://www.yupptv.com and subscribe to watch Brian Lara is NOT OUT!